The roads back to the Stant Buckner home were rough and rutted from the heavy spring rains, and I began to regret ever requesting that we make a trip back there. But Garnett's truck and Ramona's truck were up to the task (no way could Sara's van have survived much beyond a quarter mile of the side road we took to get there!) We turned off Mell Road (route 745) onto an unnamed gravel road directly across from a road shown on maps as L.W. Shirley Road. Even the rugged pick-up trucks crawled along slowly to navigate the gullies in the places. We arrived in a little clearing with a small brown house (once the wash house at Lottie and George's home), and Becky and Ramona pointed out where the home had once stood. Some in our group remembered the site and recalled which way the front porch had faced, and we stood on the spot and thought of dear cousins who once welcomed us into their home on this spot. The wash house was a marvel, too, with its own cellar and two stairways -- one outside and one inside -- leading to its trove of canned fruit and other goodies. When Becky pulled back the door at the bottom of the outside stairway, she could see some jars still lying on the floor of the cellar. Stant Buckner's home stood near this spot. Ramona is in foreground, and the old wash house is in the background. When we left the home site and drove back out the way we had come, we stopped briefly at the site of the old cemetery where Stant Buckner and his brother Charlie Madison and wife Narcissa ("Uncle Charlie and Aunt Sis") are resting. The graveyard is fenced in but entirely overgrown with thick vegetation. It was impossible to tell if the stone is gone or simply lying on the ground under the brush. 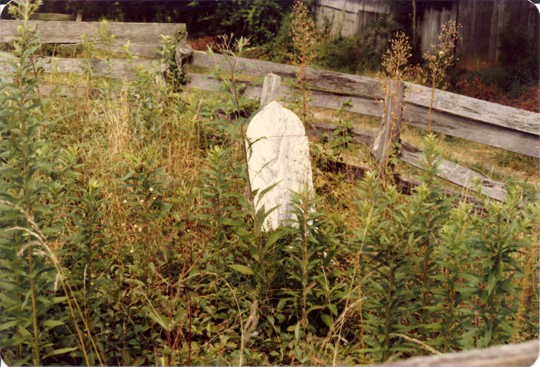 1982 photo - Small cemetery on the road to Stant Buckner's home is the burial place of Charlie Madison and Narcissa ("Aunt Sis") Buckner, whose grave is marked with this stone. There is no grave marker for Stant. 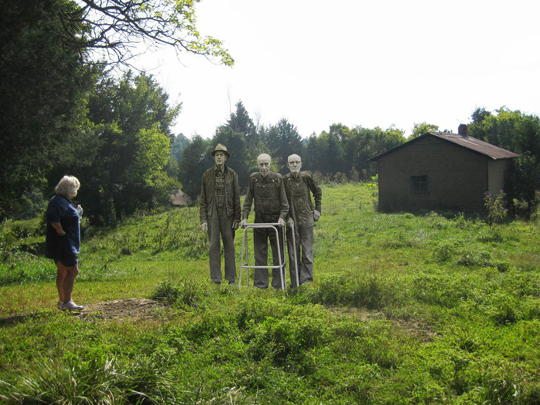 Ramona sees Jimmat, Wayne, and George on the site where their house once stood. When we returned to Richard and Jean's house, we sat in the shade of the backyard and enjoyed sweet, juicy slices of fresh watermelon while we visited and admired the view into the valley. We'd already said farewell to some of the cousins who departed earlier for other commitments, and as much as we hated to go, we had already consumed the whole day for most of the family. We said our goodbyes to Richard and his family, and I promised to come back and visit them again next October. It was perfectly ripe and wonderfully sweet! Ramona tells Wayne, while Andy looks on, how the next episode of "Backyard Oil" is going to feature her, complaining that he is taking all her oil. View across the fields from the lane which goes by Cousin Maggie's house.